Originally from the Provence region of France, ratatouille is a perfect stew of late summer fruits, vegetables, alliums and herbs. There are many ways to arrive at the final product. Some chefs recommend that you prepare each vegetable separately, combining them only at the end. Others prefer stacking thinly sliced or cubed vegetables into a casserole and baking them. In my opinion, ratatouille is best kept simple. The dish's name comes the French word touiller which literally means "to toss food," and for me, the easier to prepare and the fewer dishes dirtied the better. 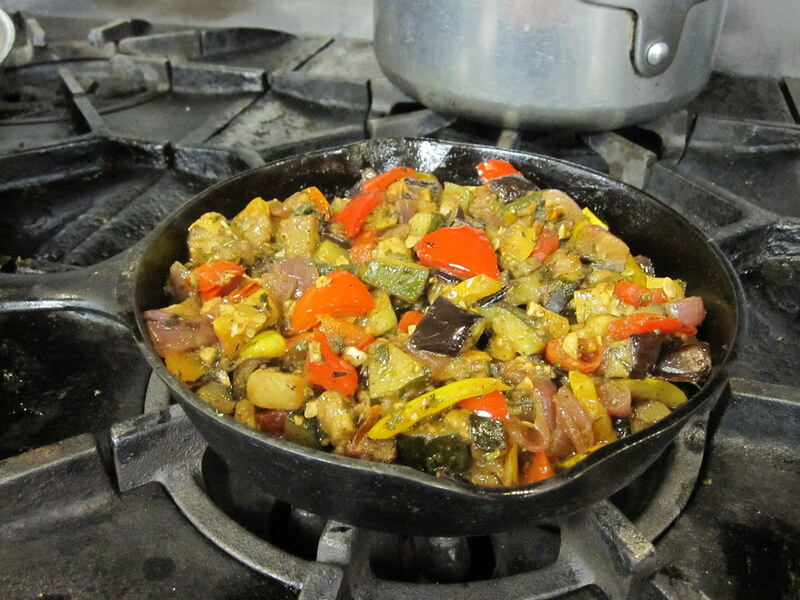 This version is prepared mostly in one cast iron pan, though I do think it's worth it to oven-roast the eggplant. Beyond that, the most important thing is not to cook these veggies a moment longer than necessary. When it's done, serve it as accompaniment to a fresh baguette, with pasta, atop a piece of fish, alongside roasted chicken or simply mixed in with some fresh salad greens and a crumble of goat cheese. It is delicious and arguably better the next day, but I would be surprised if it lasted that long. Toss the eggplant in a large bowl with oil, salt, and pepper and coat well. Spread out on sheet pan and roast about 15 minutes. In the same bowl, combine zucchini, squash, peppers and garlic. Coat with oil, season with salt and pepper, and toss well to coat. Heat 2 tablespoons of oil over medium heat in a large frying pan, cast iron skillet, or dutch oven. Add onions and saute until translucent, about 5 minutes. Increase heat and pour prepared vegetables into hot pan and cook until slightly softened, about 10 minutes. Add roasted eggplant, raw tomatoes, and fresh herbs. Cook until juices thicken and vegetables begin to caramelize, about 15 minutes. Add a splash of vinegar and salt and pepper to taste. Cook over medium heat 15 minutes more stirring gently until all ingredients are nicely combined. Ariel Nadelberg is the chef of BBG's Terrace Café. Zucchini, eggplant, yellow squash and peppers are all in season and are delicious in this Provençal stew. Photo by Ariel Nadelberg.